An East Dulwich bar and brasserie specialising in gigantic and flavoursome Alsatian tartes flambées. No relation to the famous Soho establishment of the same name, this bar and brasserie site in East Dulwich has been through as many reinventions as Madonna. It now has a deconstructed 1960s-French chalet-chic look, with music and movies to match. Chef Audrey O’Neill has brought the rich and flavoursome food of Alsace, her native region, with French wines and beers sourced by her husband Robbie. Tarte flambée is an Alsace speciality, and it resembles a large, thin oblong pizza. The versions here are deliciously crisp: one topped with crème fraîche, smoked lardons (bacon strips) and cheeses, another with goat’s cheese and lavender honey. A single tarte proved too huge a portion for one person, as was a hearty salad richly endowed with Bleu D’Auvergne cheese, mushrooms, more lardons and walnuts. This salad is not for the calorie-counting nibbler. Another distinctively Alsace dish was choucroute garni (the French version of sauerkraut), and there were cheeses such as the stinky washed-rind Munster from neighbouring Vosges. Though hardly still hungry, we managed to polish off a clafoutis – a thick slab of baked custard studded with black cherries. The French House opens at 9am for breakfast, tasty tartines (French-style open sandwiches) and good coffee in a family-friendly café atmosphere. Lunch is served from noon-3pm, dinner from 7pm. 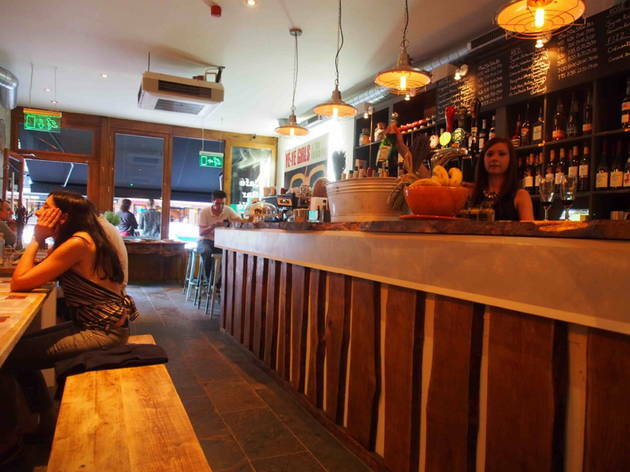 The shared farmhouse tables and benches help crank up the lively and highly sociable vibe. Warm, friendly service, reasonably priced food, nice vibe. Try the apple tart! 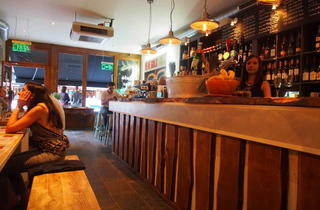 Best coffee in south London, great food and good atmosphere too. Friendly, relaxed and have excellent area for little ones. Love it here great bubbly Cremant breakfast!!!! The french house has such a welcoming and homely feel about it, with owner audrey on hand and brian the dog at your feet! Delicious pastries and tartines and never short of a great glass (bottle) of wine to go with them. All in all a great local restaurant!